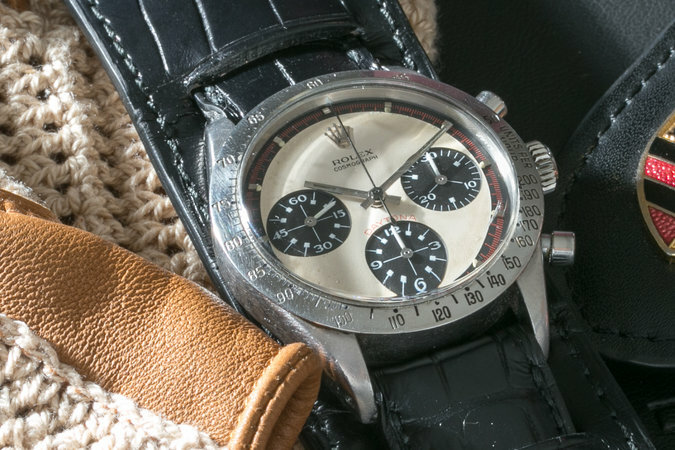 Arts | Paul Newman's Rolex fetched $17.8 million @ auction | What's Best Audio and Video Forum. The Best High End Audio Forum on the planet! "But Newman's Rolex isn't the most expensive watch of all. A pocket watch made by Patek Philippe in 1933 for the prominent banker Henry Graves sold for $24.4 million at Sotheby's in 2015." Hmmmm, for $17.8 Million, I wonder how many fakes one could build for that price?? Down to the very last scratch on the dial....LOL. Lol Davey, for few people it seems out-of-orbit, but for others living on planet Earth it seems even more to border on the high desirability of over valuing our objects of desire. Yes, $17.8 million for a used Rolex watch that only tells the time is ... a little bit too much for most of us. But it's not the watch, it's the history of that watch. ...Winning. It represents power, the ultimate, the above the rest, ...there is no second place, it's the will that places some of them over the hill, looking down from the Everest mountain. One trillion US dollars gives us all what our mind freely ventures into. In relation to, in comparison with, values are diminished, and there are no two events in our planet's history that were exactly the same. Each second is unique, and the value of time is unlimited, limitless, timeless. When someone buys history he is buying his own vapor, his own valour. For that money he could have bought almost six Bugatti Chiron (base price*), and put them in his garage under wrapping, except for one, the one he drives occasionally with an accurate GPS system telling the space locations, the latitudes, the longitudes, ...even from the planes and missiles above, plus the world atomic time with perfect exactitude, down to the most microcosmic particle of matter. But the point is not that, the point is the power of WINNING, ...that space capsule in time of Paul Newman racing the course, the circuit. It takes 1,000 billions to make one trillion. And we just don't know who has that kind of money, because Fortune magasine can't check all the underground money...Bitcoin, Gunloards, Black Gold Supreme Kings, ....all that jazz. We only know few who are @ one tenth of that figure. All of us we are in the wrong business of this side of exhaltation; audio doesn't go to these type of extremes, it has limitations, it's for normal people. We had a watch event at my place of employment about three days before that watch was sold and I got to hold that watch. There was armed guards with canine support on site 24 hours a day until those watches left the premise's. They were expecting a couple million, not $18,000,000. Kind of crazy seeing all those zeros for an old worn out watch with a story eh! just think, one can buy a new Daytona for 17k, quite a few 'zeros' less ! Personally prefer the black dial 6263 "Big Red" Daytona Woodward gave Newman after he gave away the 6239 above. The Big Red is now in the hands of Newman and Woodward's daughter Clea, who still wears it regularly.